Tech giant Nokia on Wednesday unveiled a new addition to its Asha series of phones, Nokia Asha 210. According to Nokia, the phone has been designed to offer consumers more social experiences. The phone which will be equipped with a QWERTY keyboard will have a dedicated WhatsApp button. The phone also supports Facebook, Twitter and Gmail. Asha 210 comes with a 2 mega-pixel camera (resolution 600 x 1200 pixels) which has features like editing and sharing options, says Nokia. The phone will come in both single-SIM and dual-SIM options. The phone supports WiFi and Bluetooth 2.1 + EDR. It has a RAM of 32 MB and supports MicroSD expandable memory card of up to 32 GB. The phone boasts of a screen size of 6.1 cm and weighs 99.5 grams. The company claims that it has a battery life of up to 46 days with Single-SIM and up to 24 days with Dual-SIM. According to Nokia it has a talk-time capacity of 12 hours on 2G. 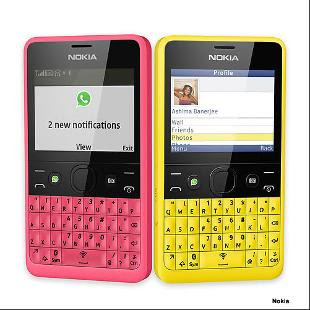 Nokia Asha 210 will be available in five colour options: yellow, cyan, black, magenta, and white. 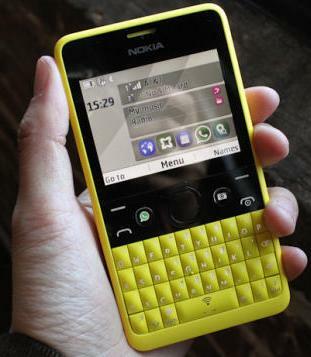 Nokia in its release said that the estimated retail price for Asha 210 is around $72. The company expects to start shipping the phone in the second quarter of 2013.